VHFC has taken over officiating the “Battle on the Beach” high school surf fishing tournament. The annual contest has students from Lacey Township High School, Barnegat High School, Southern Regional High School and Mates Academy (Marine Academy of Technology and Environmental Science) of Manahawkin competing for top bragging rights on the beach in Barnegat Light on Thursday June 6th. Further details will be forthcoming at our meetings and Newsletter as we get closer to the date. Eight volunteers will be needed for measuring fish during the 4 hour contest from 3:00 PM to 7:00 PM. If you thought 20 FOM awards were great, well for 2019 there will be 21! A new award for White Perch has been added with weigh ins accepted from April 1 through June 30. Also new for 2019, if no weigh ins are made for a species for a specified period, the award will be added to the next time period that species is offered. See the VHFC Contest Rules pulldown under the Contest/Tournaments button on the Blue Banner across each page for further details. New T Shirts will be available this year. Look for the order form in the April Newsletter. Sizes will range from XS (Extra Small) to 6XL. All sizes will be available in nine colors. 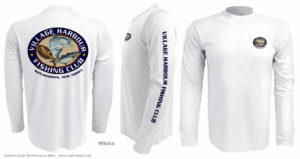 Shirts have long sleeves and feature UPF 50 Sun Protection. White is shown in the photo. New hats will also be available this year. 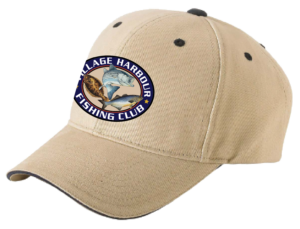 Hats will be khaki colored, feature a high definition VHFC patch on the front and will sell for $20. See photo below. Last year’s tournament was fantastic and we expect this year’s to be even better. We are planning for July 13 so Save the Date! Further details provided later this year. Details are still TBD but once again, VHFC will have a dinner in the fall. Always a great time and a good excuse for members and spouses to gather for some fun! Vince Sibona will provide details as available. Despite a small turnout, 5 VHFC anglers had a blast last fall with non-stop drop and reel fishing for jumbo porgies and an occasional seabass. Details for this year’s trip will be provided later this summer.